Nuclear power's biggest trade group in the U.S. has announced its yearly honors for leaders in the industry, with Constellation Energy's Calvert Cliffs plant earning high praise for an innovation that cuts nozzle installation time by more than 75 percent. The Nuclear Energy Institute recently awarded the plant's employees the 2013 B. Ralph Sylvia Best of the Best Award for their innovative Mini-ID temper bead welding process. While installing pressurizer lower head heater nozzles and level nozzles, their process reduced the volume of weld material by 90 percent, according to an NEI release. It slashed the weld time for a single installation from 18 hours to four hours and saved the company $17.5 million during a recent maintenance outage. What's more, the NEI said the technology can also be applied at nearly 70 other U.S. reactors. Duke Energy employees at the Oconee nuclear station in South Carolina are recipients of the AREVA Vendor Award for pioneering a new approach to reactor vessel inspections. Employees of Exelon Generation at the Clinton power station in Illinois were recognized with the GE-Hitachi Nuclear Energy Vendor Award for their development of annual fuel cycles that improve fuel efficiency and the cost effectiveness of their reactor refuelings. Dominion team members at Virginia’s North Anna nuclear station won the Westinghouse Design Vendor Award for their Emergent Fuel Assembly Capture Tool Project. NextEra Energy employees at the Turkey Point, St. Lucie and Point Beach nuclear facilities earned the Westinghouse-Combustion Engineering Design Vendor Award for their power uprate program. NextEra Energy employees at the St. Lucie and Turkey Point nuclear energy facilities won the Community Relations Reward for their program to demonstrate the value of nuclear energy through communications about the Florida Power & Light power uprate program. Entergy team members at the Grand Gulf nuclear station in Mississippi earned the Operate Plant Award for their improved liquid radwaste processing water filtration innovation. Exelon Generation employees at Pennsylvania’s Limerick nuclear energy facility won the Equipment Reliability Award for developing a more effective way to analyze the performance of steam relief valves. Constellation Energy Nuclear Group employees at Calvert Cliffs also won the Maintenance Award for their pressurizer heater sleeve replacement project. Entergy employees at the company’s headquarters were awarded the Materials and Services Award for their fuel failure detection process that can accurately identify small fractures in fuel tubes of boiling water reactors. FirstEnergy employees at the Beaver Valley, Davis Besse and Perry nuclear energy facilities were honored with the Management Processes and Support Services Award for their Proactive Integrated Equipment Reliability and Strategic Sourcing initiative. An Exelon Generation employee at the Braidwood station in Illinois captured the Plant Support Award for his Total Recall X-ray machine innovation. American Electric Power employees at the Donald C. Cook nuclear plant were recognized with the Nuclear Training Award for developing virtual simulation technology to enhance training. Employees of Exelon Generation at the LaSalle generating station were honored with the Fuel Award for their spent fuel pool storage rack innovation. Employees of Constellation Energy Nuclear Group at the Calvert Cliffs power plant also won the Vision & Leadership Award. 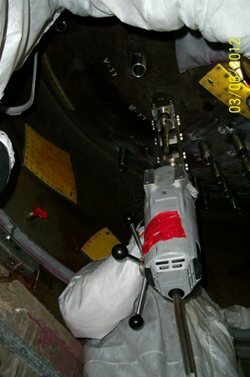 The team developed an inspection process and tools to assess the integrity of nuclear fuel dry storage modules and the canisters inside them that hold spent fuel.